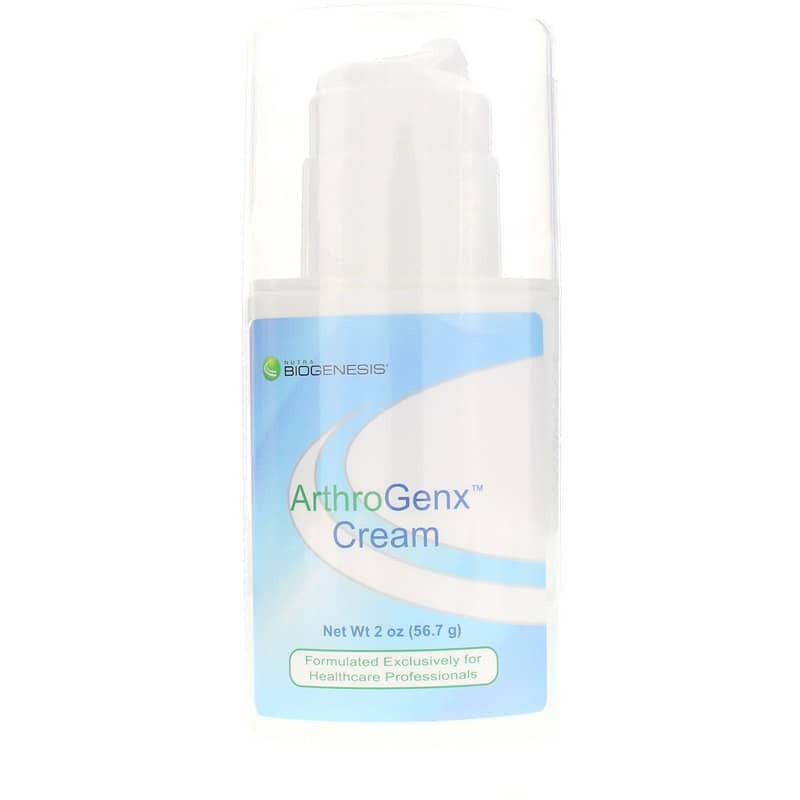 Arthrogenx Cream from BioGenesis combines botanicals, natural oils, and connective tissue repair compounds for healthy joint support. Arthrogenx Cream can be used alone or in conjunction with oral products such as: ArthroGenX capsules, Pain X, EPA/DHA, Flax Oil, etc. It is formulated with long-term results in mind. Although it gives an immediate sense of warmth to help ease pain, it does not stop with just analgesic benefits. Essential Fatty Acids - from Emu Oil. 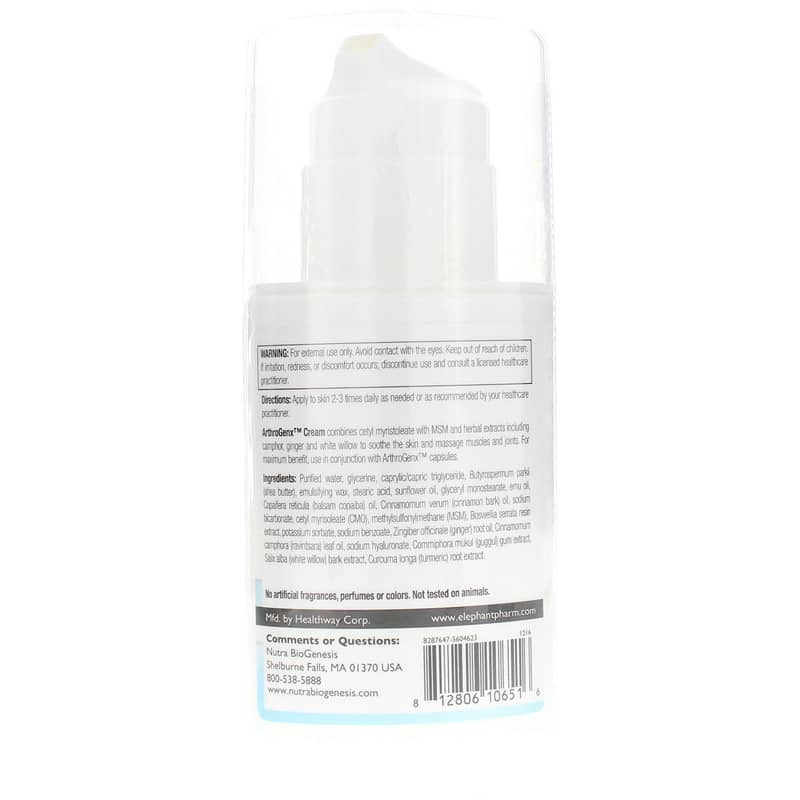 Purified water, glycerine, caprylic/capric triglyceride, Butyrospermum parkii (shea butter), emulsifying wax, stearic acid, sunflower oil, glyceryl monostearate, emu oil, Copaifera reticula (balsam copaba) oil, Cinnamomum verum (cinnamon bark) oil, sodium bicarbonate, cetyl myrisoleate (CMO), methylsulfonylmethane (MSM), Boswellia serrata resin extract, potassium sorbate, sodium benzoate, Zingiber officinale (ginger) root oil, Cinnamomum camphora (ravintsara) leaf oil, sodium hyaluronate, Commiphora mukul (guggul) gum extract, Salix alba (white willow) bark extract, Curcuma longa (turmeric) root extract. Contains NO: artificial fragrances, perfumes or colors. Not tested on animals. Adults: Apply to skin 2 to 3 times daily as needed, or as directed by your healthcare practitioner. After using ArthroGenx cream for only a few weeks, I have felt genuine improvement. I bought ArthroGenx Cream for my husband. He was very pleased with the results.